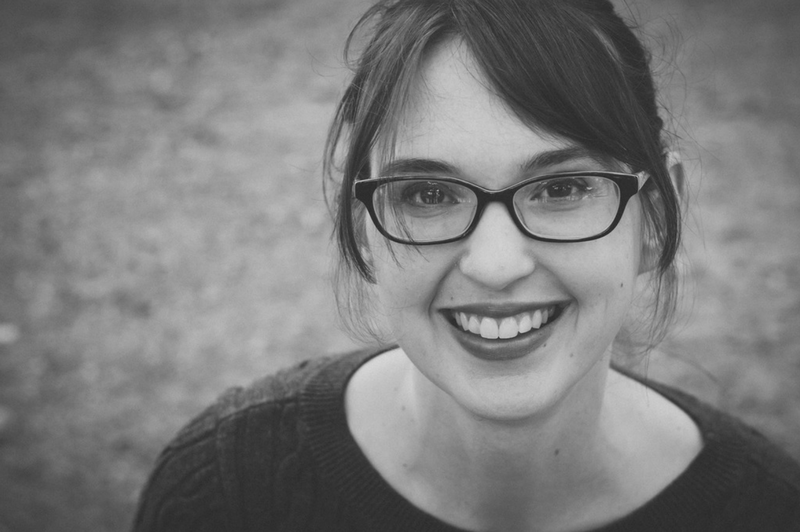 Have a little ENCOURAGEMENT delivered to your inbox! Today is a special day… it’s the First Day of Fall! Yay!!! On Monday when I filled in my schedule for the week I quickly jotted down the words “Poetry Tea Time” for Thursday but when I did that I didn’t notice that it was technically the last day of Summer. Contains affiliate links. Please see my disclosure policy. So, we decided to have a little early preview of Fall for the little kids in the house. They are still learning their seasons (and their months) so my 10 year old daughter, and I, thought that this would be a fun time to do this. We like to do Poetry Tea Times as part of the Bravewriter Lifestyle. It is a lovely way to share poems and time together. 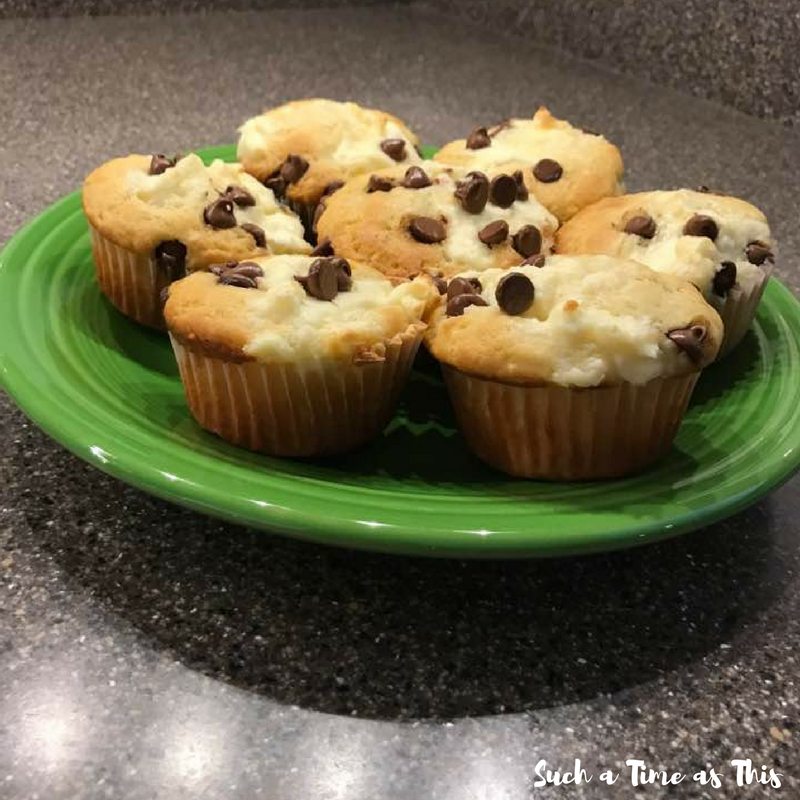 I whipped up some cream cheese chocolate chip muffins (wait for the recipe tomorrow!!! Here is the recipe!) and she helped make some other fancy things. 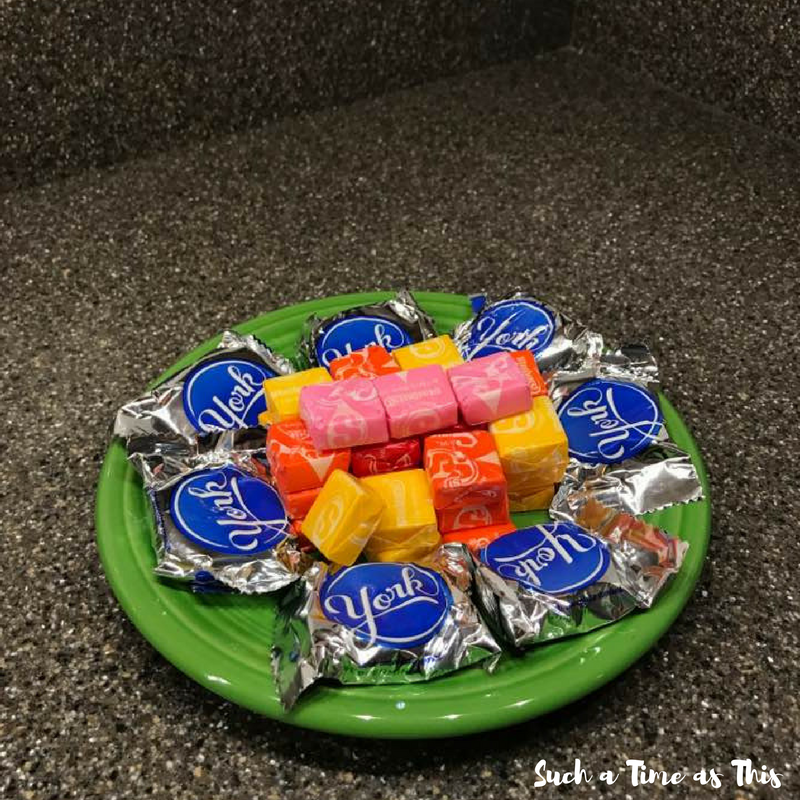 Like a plate full of candy. Don’t judge. It’s been a long week. And some hot cocoa. Even though it is 93 degrees out, my kids still love some hot cocoa. We decided to decorate the table all fancy like for Fall. This is about as fancy as I get. We put some placemats on the middle of the table to form a runner. Hubby had bought me some flowers, earlier in the week, that were very fall-esque, and we we got out our best “china” teacups. The kids and I took turns saying some poems that we have memorized. I read to them from the IEW Poetry Memorization Book which we absolutely adore. We also said some Bible memory verses that we are working on. It was a fun way to break up some of the monotony of what would have been a rather boring Thursday. 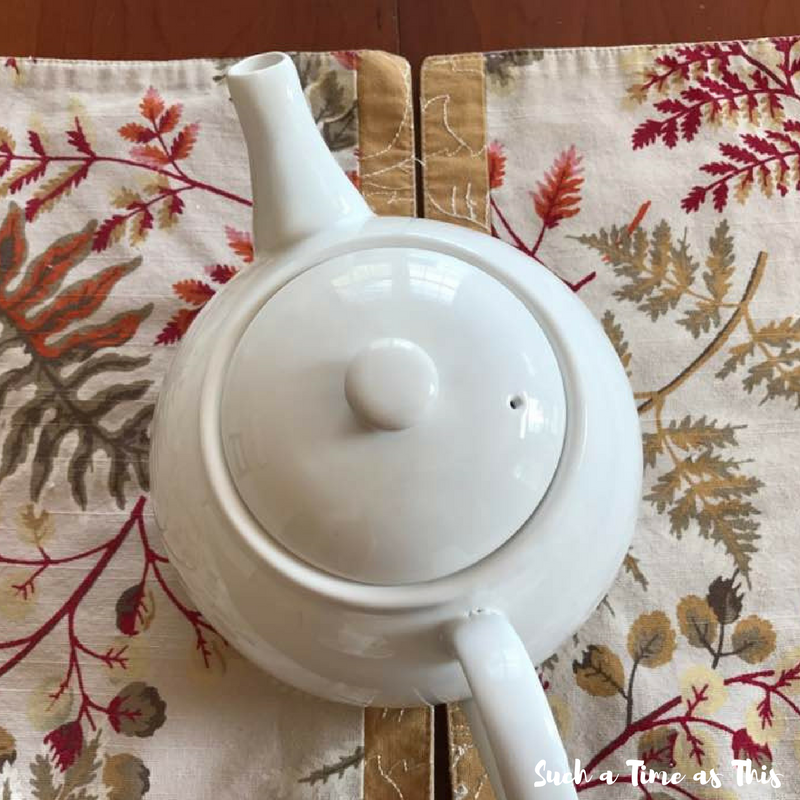 Poetry Tea Times are something everybody enjoys – – from the 2 year old to the teenager. I, too, enjoyed a little break in the mid-morning hours. 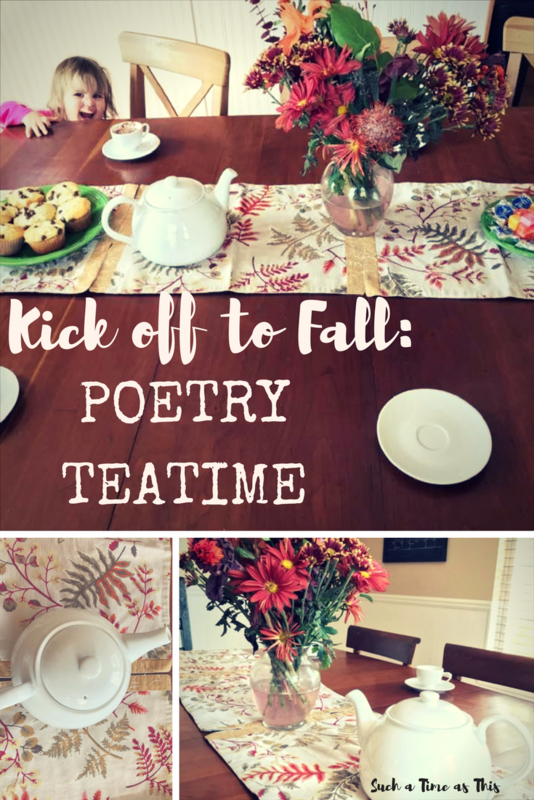 I hope this inspired you to make up your own fun Fall Teaparty or Poetry Teatime. This is part of the joys of homeschooling, ladies! Seriously, though, it is a time of togetherness in this all too busy world. It doesn’t have to be difficult – we, truthfully, just threw this together with things we already had in our home. It is a simple joy that can turn around your day and make you remember the blessings in your life. If you are interested in learning more about BraveWriter – I have read The Writer’s Jungle (which is an awesome guide book to all things Bravewriter… The author, Julie Bogart, guides you in how to incorporate the Brave Writer lifestyle into your homeschool week: this includes movie times, poetry tea times, copywork and other fun activities your kids will go nuts over). I am now using some of their writing curriculum with our kids, as well. 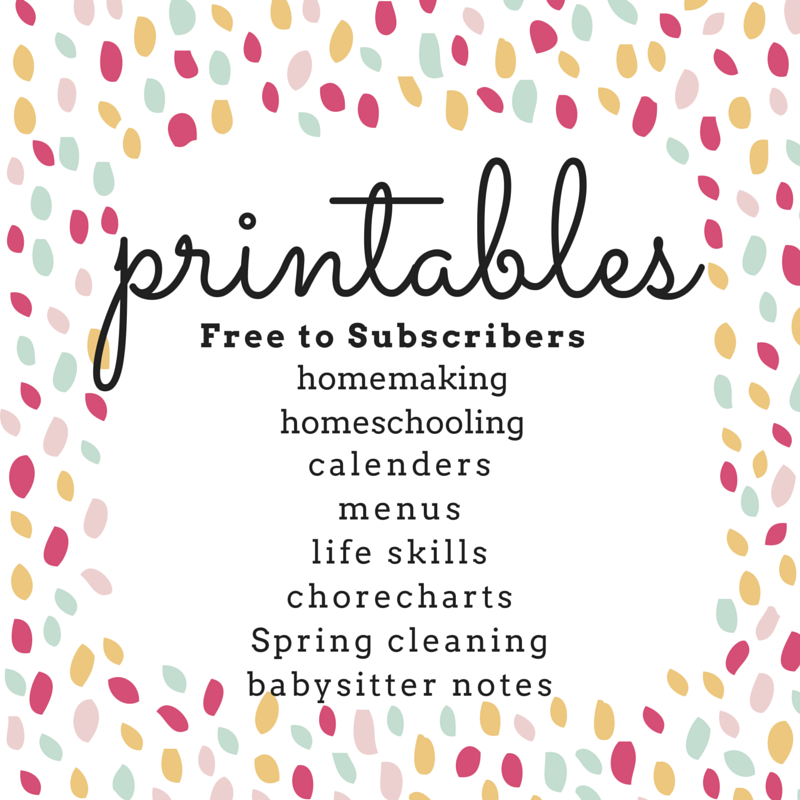 Some of their products are available through Homeschool Buyer’s Coop (which is free to join – if you haven’t joined yet, you should! Tons of great resources at low prices). Click here for more info on BraveWriter. Do you do anything to mark the new seasons? 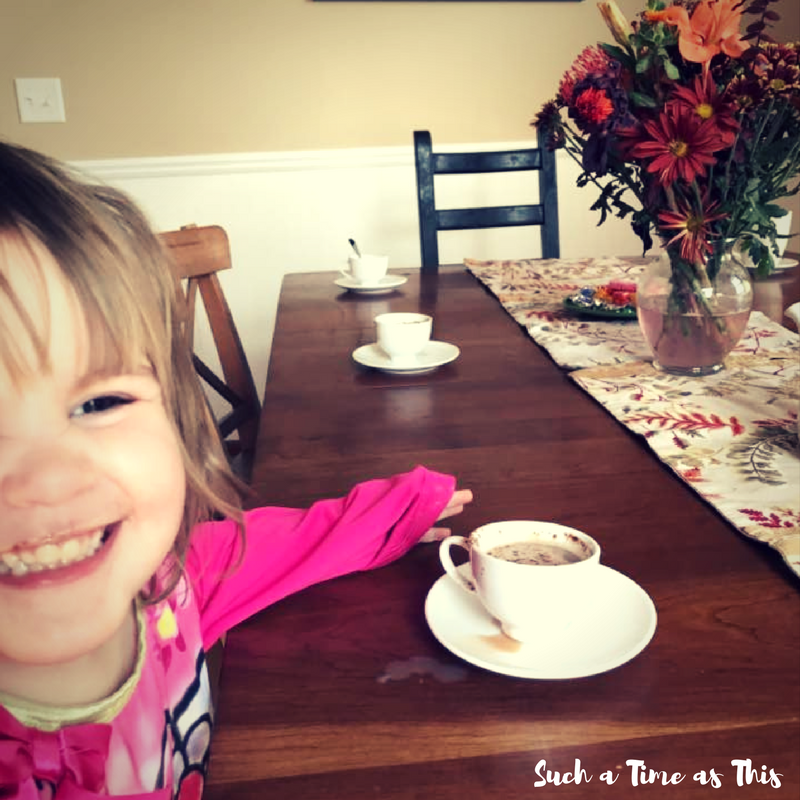 Have you ever tried a poetry tea time with your kids? This is a fun and wonderful idea to teach the young kids their seasons and making a tea party sounds wonderful. Plus you get to decorate. Yes! It’s so fun to decorate for Fall. Awww! It’s been unseasonably warm in Chicago this past week. It went from 60s to 90s literally overnight! I’ve never been to California but I bet it’s beautiful. I agree about Fall … totally my favorite season! This is so cute, such a fun idea! Thank you so much Jenna! 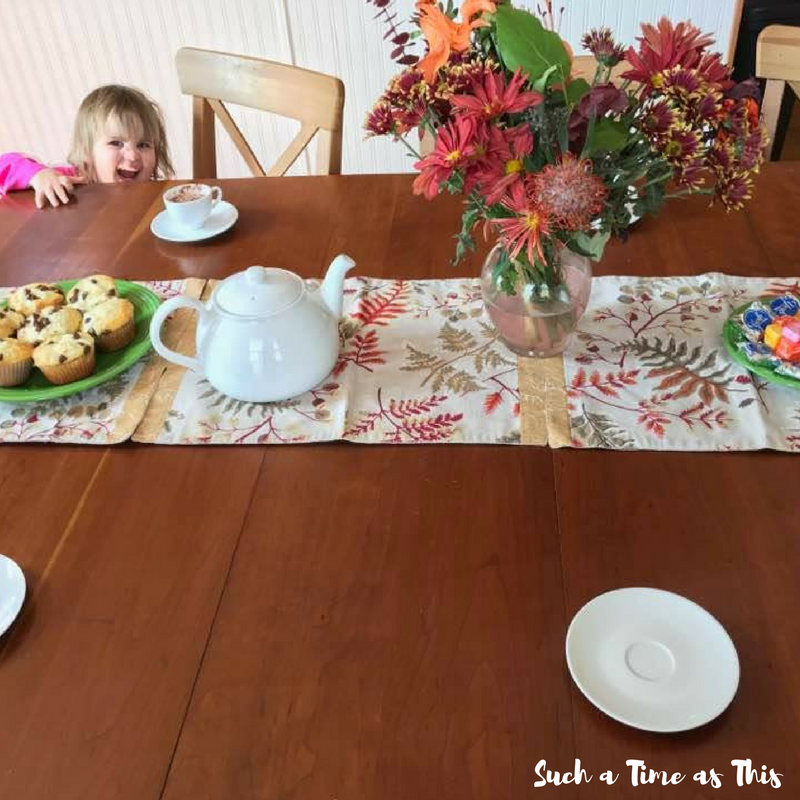 I love the idea of a tea party – I’ll need to do this with my daughter! This is such a great idea. My kids love “tea time”. 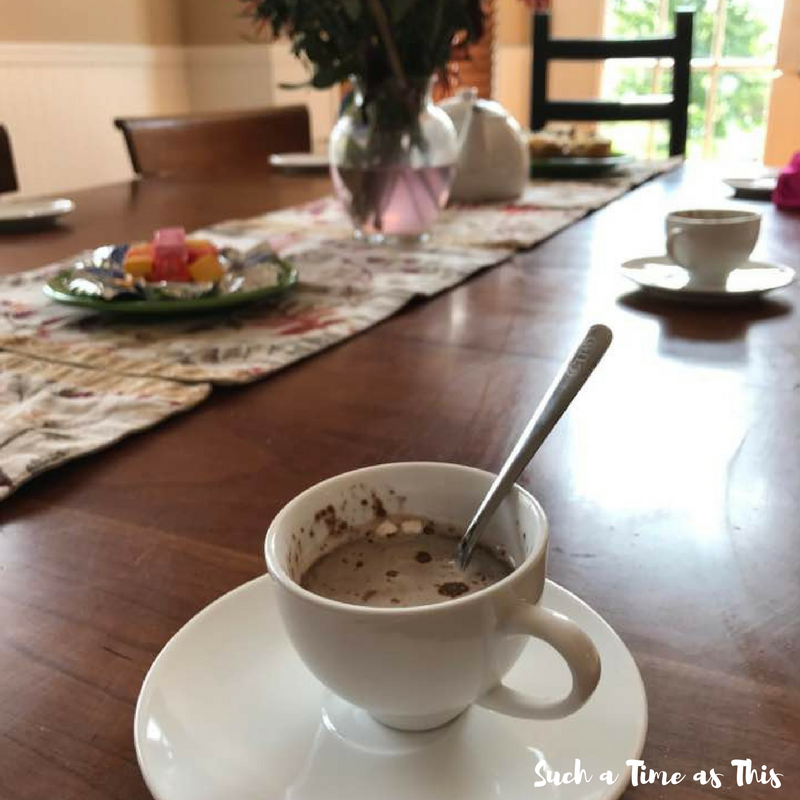 It’s Not so much about what you’re putting on the table, it’s more about the time you’re spending with each other, special treats, a special break. 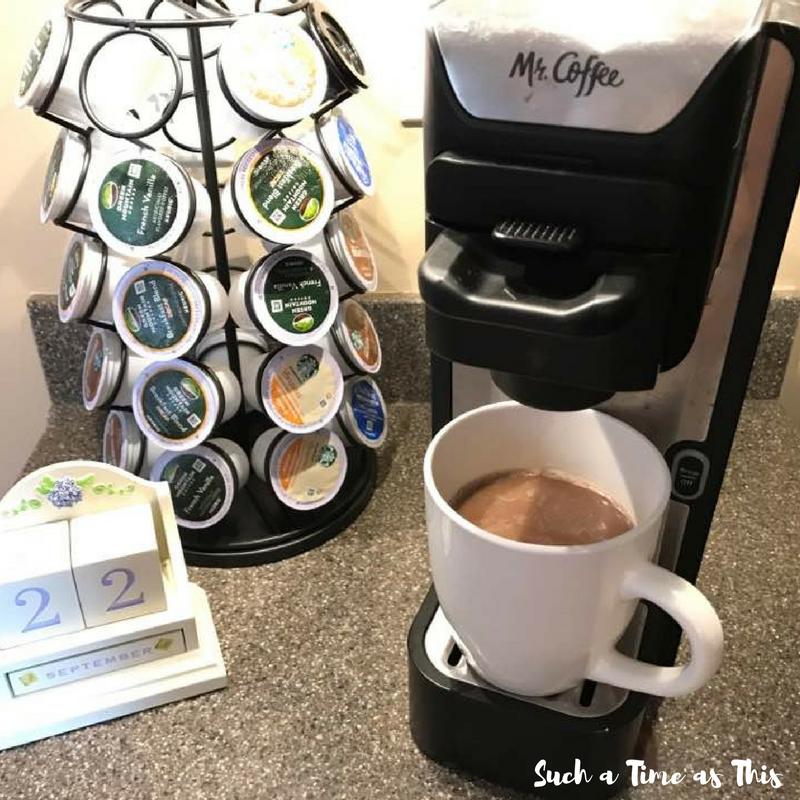 My kids will be down for the hot chocolate! Jennifer – You are absolutely right! Awww. What a cute idea! 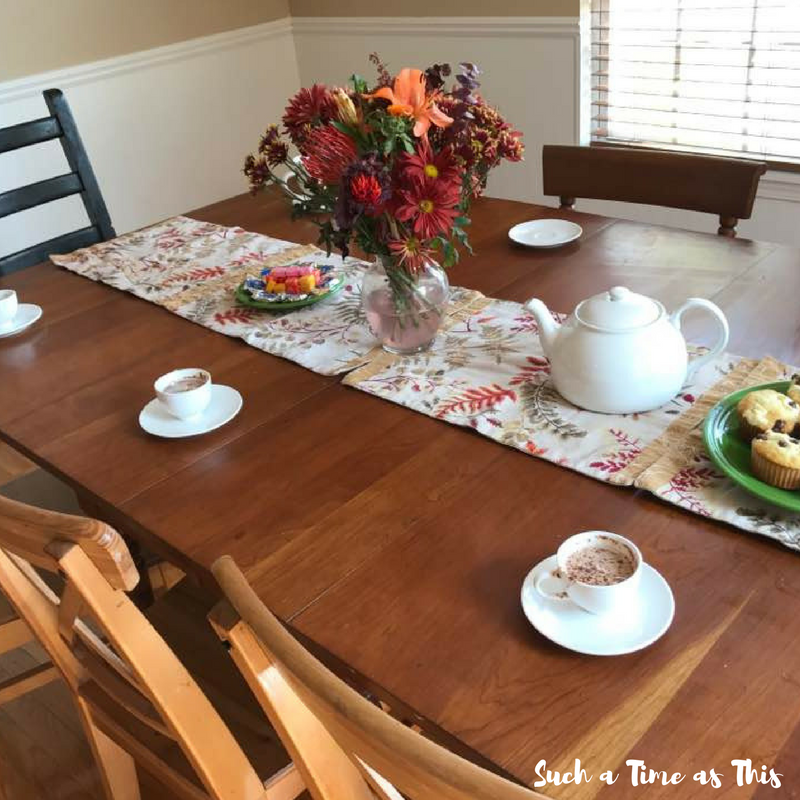 I love the thought of having tea-time with my kids and welcoming in Fall! This is such a beautiful fall table. 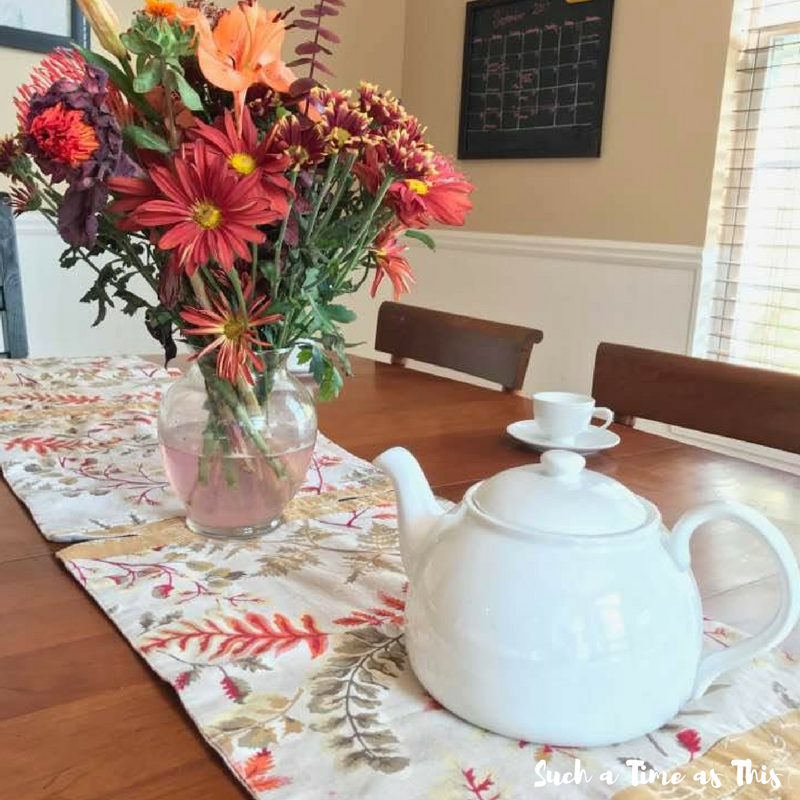 I love tea in the fall and between the burgundy and orange colors in the flowers and the tea pot, I just want to curl right up alongside your family.